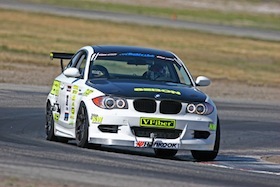 Results of actual tests on the effectiveness of titanium alloy as a heat shield for brakes. * Got any hard numbers on temperature reduction? Home >> Brake Heat Shields >> Got any hard numbers on temperature reduction? Got any hard numbers on temperature reduction? We don't expect you to buy our brake heat shields based on blind faith. 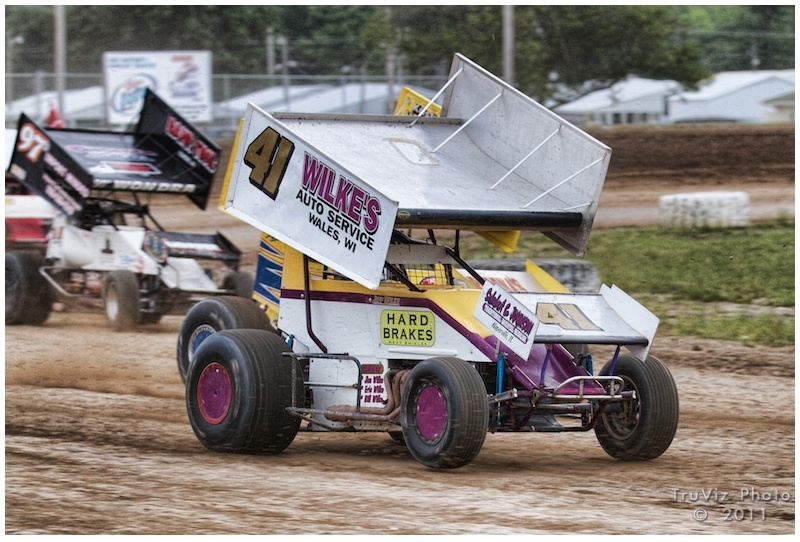 Our track testimonials give numerous examples of real world results at the track in racing conditions. In addition, we have conducted laboratory experiments to quantify the effectiveness of our titanium brake shims. We took a normal brake pad and put it in contact with a 960F heat surface and measured the temperature at the back of the pad over time. This is measuring the temperature at the contact area where the brake caliper piston would meet the back of the pad, and where heat transfer into your brake fluid and hydraulics system begins to occur. After measuring the results with no heat shield in place, we ran the same experiment with our standard titanium shim placed at the back of the pad (again, where the brake caliper piston would press against the pad/shim). The results showed a very significant reduction in temperatures over time, as shown in the chart below. After 10 minutes of exposure to the heat source, the unshielded brake pad measured 547F at the caliper interface. 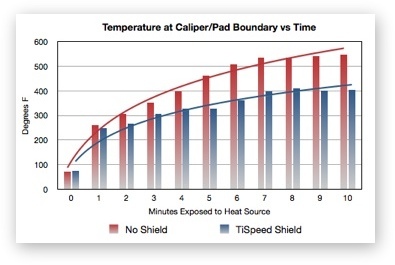 In comparison, the pad with the titanium heat shield measured only 404F, a reduction of 143F degrees! As this test result proves, our titanium heat shields are effective at creating a "thermal break" or barrier between your glowing hot pads and rotors and your brake hydrualic system. The benefits to you are reduced brake fade from brake fluid boiling, increased brake fluid life, and increased life for your brake caliper components such as caliper seals, dust boots etc.